Brose's CFRP door structure delivers maximum functional integration, thereby reducing the number of parts and hence costs significantly. OEMs only need to mount and screw on the outer door panel, which considerably reduces assembly time. Lightweight design and efficiency remain at the top of the automotive industry's list of concerns due to the ambitious global CO2 targets. The international supplier Brose has set new benchmarks in this field. The mechatronics specialist received the "Automotive Innovations Award 2013" in the car body and exterior category in May for its lightweight solutions and the comfort and safety features for doors and liftgates. The award is presented each year by the Center of Automotive Management (CAM) in conjunction with auditing firm Pricewaterhouse Coopers AG (PwC). The judges were particularly impressed by the innovations in lightweight materials for door systems. According to the supplier, carbon fiber reinforced plastics (CFRP) provide great potential for the future. The material is extremely light and energy efficient, yet it can be shaped into almost any design while retaining its strength: a composite material that provides substantial weight savings without sacrificing safety and comfort. Brose is demonstrating its vision of the future use of CFRP by showcasing a lightweight door concept that perfectly combines design, material and manufacturing technology. The CFRP prototype features a layered structure designed to withstand specific stresses, saving an additional 4 kilograms of weight per door compared to aluminum and as much as 11 kilograms compared to steel. In addition, this door concept provides new possibilities for the vehicle assembly process. Thanks to maximum functional integration, the number of components and hence costs can be significantly reduced. OEMs only need to mount and screw on the outer door panel, which considerably reduces assembly time. Another benefit: if the wet side of the door needs to be accessed or small dents repaired, the outer door panel can be easily dismounted or even replaced, if necessary. CFRP provides design potential for high-precision shaping of the wall thickness, fiber orientation and layer structure: where more strength is required, the material can be reinforced or the fiber orientation adjusted without affecting the ultra-thin wall strength in other areas. Thus, it is possible to dispense with reinforcement sheets used in standard systems against stress caused by door lowering, wind forces and torsion in the door inner panel. Aramid fibers with increased ultimate strain for crash-relevant areas ensure crash safety whereas carbon fibers are used in areas requiring great strength and/or stiffness. 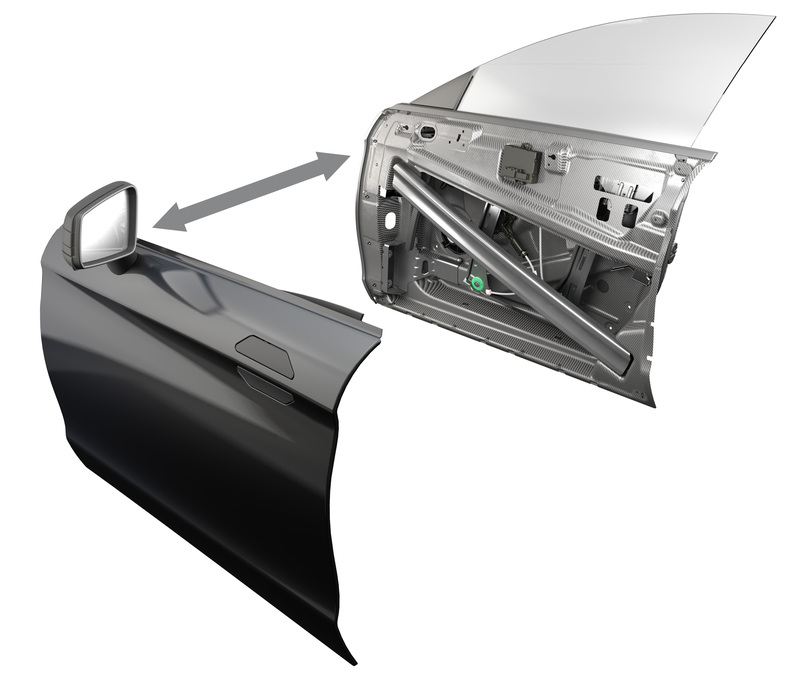 The concept door also features an integrated side impact beam – a component that OEMs assemble in the outer door panel of standard door systems. At Brose, this crash-relevant component comes with a woven and thus flexible carbon fiber chamber profile, filled with integral foam. Due to long cycle times and low quantities, fiber composites are still regarded as unviable for series production of high-quality vehicle parts. According to experts, the material and production costs for carbon parts are likely to drop significantly through 2020. In addition, the composites industry is intensively exploring more efficient processing technologies to enable quick, reliable and low-cost production of high-quality CFRP parts: the cycle time of the RTM process (Resin Transfer Molding) – particularly suitable for the production of shell parts – has decreased from approx. 15 minutes to less than 5 minutes over the last two years and this figure continues to decline. The pultrusion process or pull-braiding is used for profile parts such as the side impact beam. Here it is possible to manufacture straight and bent profiles in a continuous process at comparably low tool costs. Since both methods produce virtually no waste, material costs can also be reduced. The New Stratos on display at the Brose stand in Hall 4, “Europa” room is a perfect example of the potential CFRP has to offer. Chairman of the Brose Group Michael Stoschek and his son Maximilian Stoschek joined forces in a personal project to develop and build a one-of-a-kind race car approved for use in road traffic. to deliver maximum performance and minimum weight. The result offers outstanding vehicle performance and exciting driving characteristics, all possible thanks to the drastically reduced vehicle weight and the extremely stiff car body: the New Stratos weighs 1,247 kilograms, has 540 hp and can accelerate from 0 to 200 kph in 9.6 seconds.